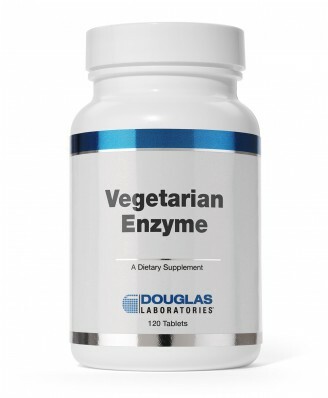 Vegetarian Enzyme tablets, provided by Douglas Laboratories, are dietary supplements of vegetable-source enzymes (suitable for vegetarians) which are specific for starches, proteins, fats, and cellulose, a dietary fiber. 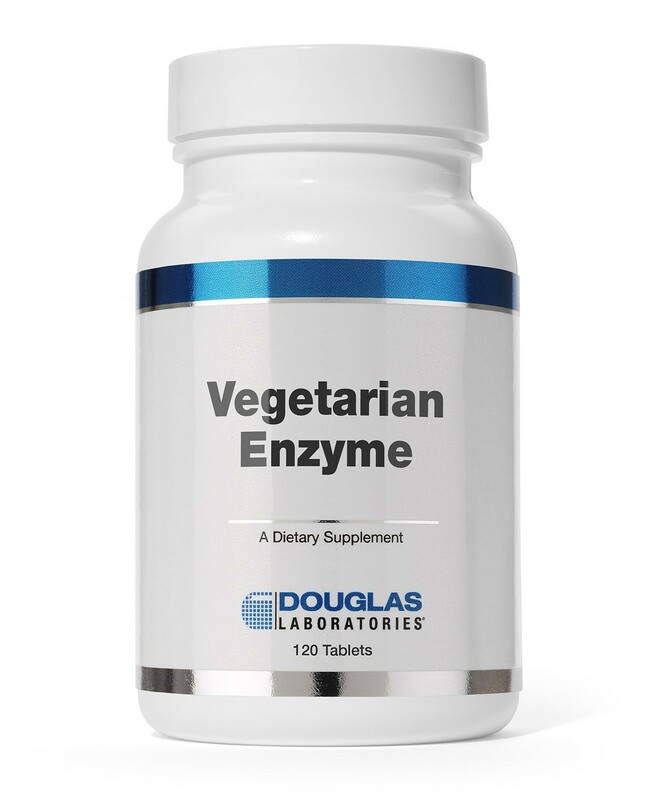 Vegetarian Enzyme tablets, provided by Douglas Laboratories, are dietary supplements of vegetable - source enzymes (suitable for vegetarians) which are specific for starches, proteins, fats, and cellulose, a dietary fiber. The pancreas supplies the major digestive enzymes that catalyze the breakdown of starches (carbohydrates), p roteins, and fats, so that the breakdown products can be absorbed in the upper small intestine. Some carbohydrate digestion takes place in the mouth by salivary amylase, but pancreatic amylase is the major carbohydrate - digesting enzyme. Amylases break down starches to maltose and maltotriose, which are further hydrolyzed into glucose by the disaccharidases of the mucosal cells, and then absorbed. Although cellulose is indigestible by pancreatic and intestinal enzymes, the microflora within the large intesti ne may degrade it and produce uncomfortable symptoms in the process. Although fat digestion starts in the mouth with the action of salivary lipase, the great majority of fat triglycerides are digested by pancreatic lipase secreted by the exocrine pancreas into the duodenum. Lipases break down triglycerides into monoglycerides and free fatty acids, which are efficiently absorbed in the upper small intestine. Protein digestion is initiated in the stomach by pepsin and hydrochloric acid, which denature and bre ak large proteins down to smaller polypeptides. In the small intestine, proteases break down these polypeptides into free amino acids, and di - and tripeptides, which are directly absorbed by the intestinal mucosa. Vegetarian Enzyme provides catalytically a ctive enzymes specific for fats, carbohydrates and proteins, similar in effectiveness to pancrease - derived digestive enzymes. Vegetarian Enzyme tablets may be a useful nutritional adjunct for vegetarians who wish to supplement their diets with digestive enzymes that do not come from animals. Adults take 1 or 2 tablets 3 times daily with meals or a s directed by physician. As a dietary supplement, adults take 1 or 2 tablets 3 times daily with meals or as recommended by a healthcare professional.